In-Memory tables were introduced in SQL Server 2014 and were also known as Hekaton tables. I’ve written previously about In-memory tables for SQL Server 2014 and you can check in my [previous posts] to know more about these type of tables with some Hands-on examples and demos. 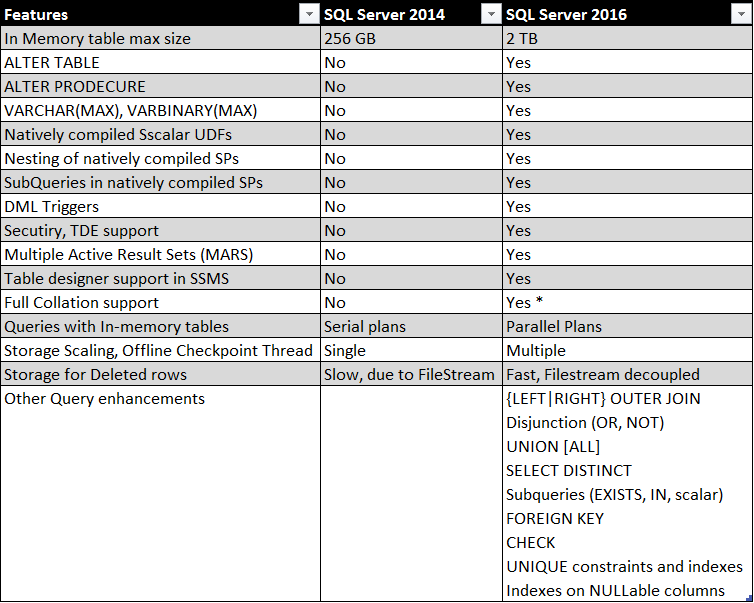 –> In-memory tables as new concept in SQL Server 2014 had lot of limitations compared to normal tables. But with the new release of SQL Server 2016 some limitations are addressed and other features have been added for In-Memory tables. These improvements will enable scaling to larger databases and higher throughput in order to support bigger workloads. And compared to previous version of SQL Server it will be easier to migrate your applications to and leverage the benefits of In-Memory OLTP with SQL Server 2016. –> You can check more about In-Memory tables for SQL Server 2016 in MSDN BoL [here]. Do you know if there are any changes with cross-database queries in 2016? For example, can a database that does not have a memory-optimized filegroup access a hekaton table in a memory-optimized database? Temporal data support in SQL Server 2016 – Part 1 Leap Second coming this June 2015, will it affect SQL Server?